At GoToMySportsPhysical.com you save time, money, frustration and hassle. 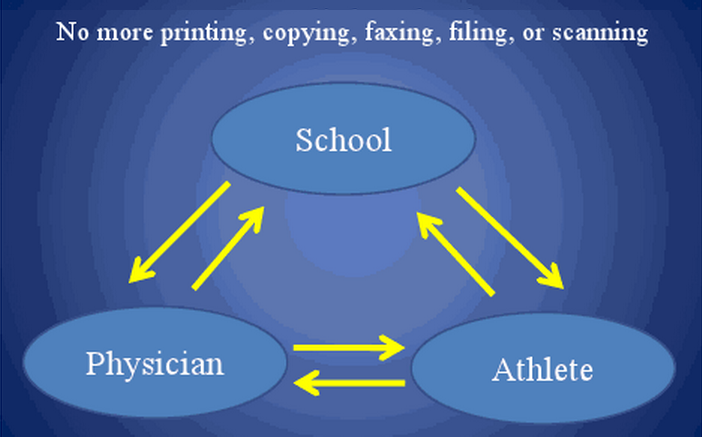 In the paper world, sports physical forms have to be printed, scanned, copied, faxed, and hand delivered. Forms are often misplaced, lost, filled out illegibly and incorrectly. 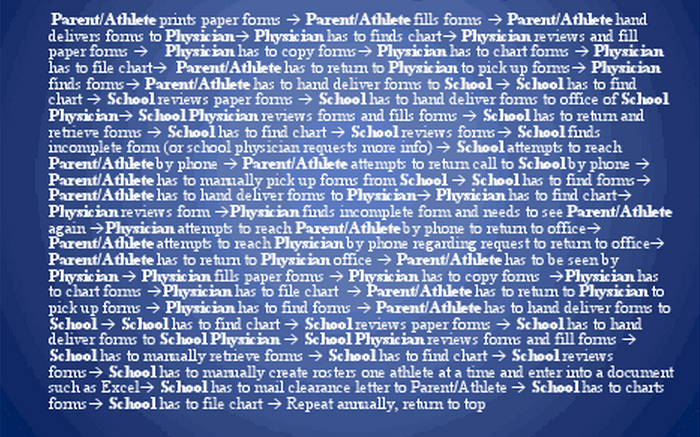 40% of paper sports physical forms are turned in incomplete by the doctor and athlete. Athletes miss tryouts and practices as a result. Parents, athletes, and coaches get angry. Repeat doctor visits have to be made. Physician and school offices are buried in paper work, faxes, and phone calls. Schools and physicians have to pay for more staff. Time is wasted. At GoToMySportsPhysical.com you are free of all paper hassle. 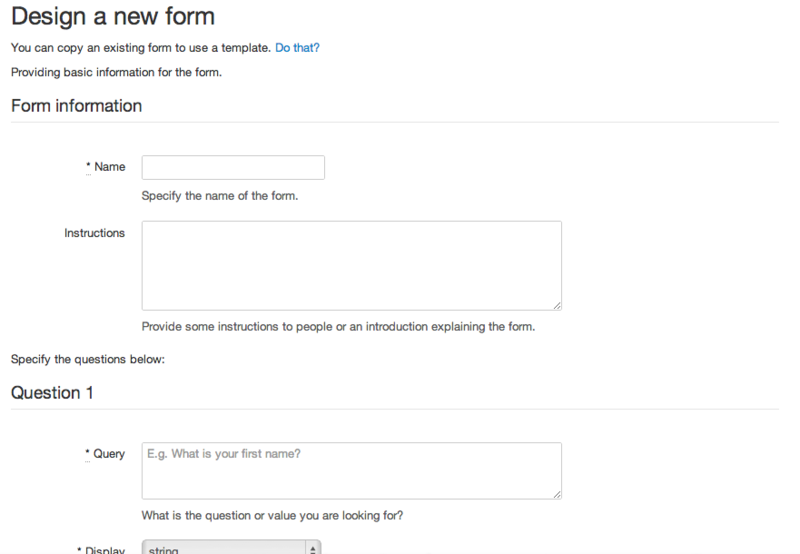 Schools can now make all of their custom sports physical forms into online, electronic forms with our simple form builder, including options for custom field validations. 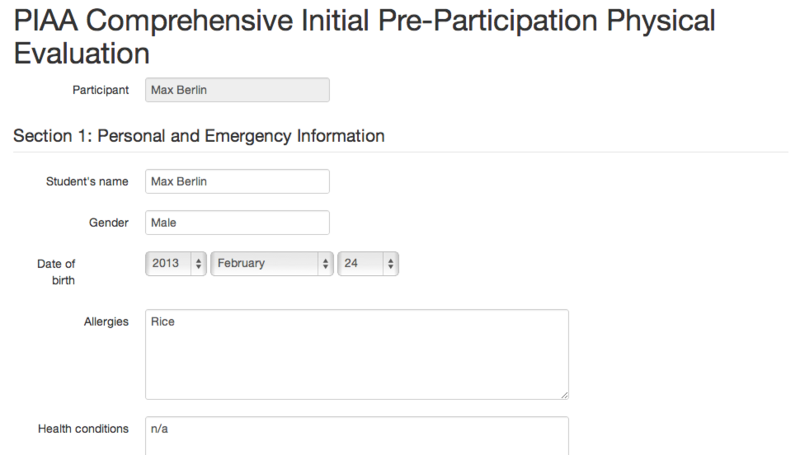 Or use any of the forms pre-loaded into our system, such as the NJ State Pre-Participation form. At GoToMySportsPhysical.com the athlete fills out the health history portion of the sports physical form online and submits the form electronically to his or her physician. Other required sports physical forms are filled out online and submitted directly to the school. A physician then reviews the health history of their athlete online and—after performing a physical examination—fills out the sports physical exam form online. The completed sports pre-participation physical evaluation is then submitted electronically to the school or camp (and team physician automatically, if applicable). Athletes have direct access to their information and automatically and instantaneously receive a copy of their completed sports physical form. When cleared by their school, athletes are notified electronically, automatically and instantaneously. Team physicians can review and manage all of their sports physical forms online and electronically 24/7. Schools can review and manage all of their sports physical forms online and electronically 24/7. With one click, schools can generate team rosters and export them to Excel. Incomplete sports physical forms can never be turned in with GoToMySportsPhysical.com.